Abhik Dutta is a passionate traveller who is particularly partial to Sikkim. To support a lifestyle that allows him to travel, along with his partners, he runs an outfit that provides holidays to remember. After completing my two days of white water rafting on the Teesta river, I got off the raft at the put out point a little ahead of Teesta Bazar. I took a share taxi (jeep) and drove up to Ranipul, 10 kms before Gangtok. En route to Ranipul on NH 31A, there is a village of `Martham', but it is not to be confused with the Martam village near Rumtek. It was around 2 pm when I reached Ranipul, a small town at an altitude of around 2,000ft. From there, I took a taxi to Martam. From NH 31A, we took the left fork and gently drove up the narrow meandering road. It is a lovely drive to Rumtek and Martam as the road snakes through typical Sikkimese villages and a great many paddy fields. The sight of so many paddy fields, some of them with saplings just planted ahead of the rains was breathtaking. The sky having cleared after a sudden rainfall an hour back, the afternoon sun peeped from behind the clouds and sunlight draped the flooded fields. The farmers were knee deep in water and the greenery all around was breathtaking. The surrounding hills wore the look of a dainty maiden still wet from a refreshing shower. The sweet smell of wet mud and vegetation was all pervading. The streams were full, and the muddy torrent gushed down the hillside; rainwater dripped from the trees and the hillside. Villagers were emerging from their homes after an afternoon siesta and school children smiled and waved at me as our car drove by them. I halted at many places for photographs. The driver said that the entire area resembles a green carpet from July to Sep. Later, during Oct-Nov, which is the harvest season, the entire place is a sight to behold with golden paddy swaying in the breeze. From Dec onwards, the paddy is harvested and the hill takes on a brown hue. The first halt was Rumtek Monastery, 12 kms from Ranipul. From the car parking area it's a 10min uphill walk along a paved road. A long row of wooden prayer wheels on the wall greets you as you approach the stupendous monastery. 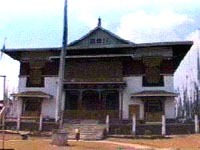 The present Monastery was founded by His Holiness the XVI th Gyalwa Karmapa, Rangjung Rigpe Dorjee, holder of the sacred treasure of Vajradhara. As the Supreme Head of the Kagyu Order of Tibetan Buddhism, he embodies, represents and guides its accummulated spiritual energy. He was born in Eastern Tibet in 1923 to a noble family and was recognised at the age of eight, as the new Gyalwa Karmapa in accordance with a letter from his predecessor predicting this event. In 1959, he had to leave Tibet with his followers after the Chinese invasion. To preserve the wealth of his lineage and portable spiritual treasures & relics, Gyalwa Karmapa came to India through Bhutan. The surrounding hills wore the look of a dainty maiden still wet from a refreshing shower. From there he was invited by His Majesty Chogyal Tashi Namgyal of Sikkim to come to Sikkim and build monasteries there. There are many ancient Kagyu monasteries in Sikkim. It was in the old Kagyu Rumtek Monastery (down the main road) where Gyalwa Karmapa stayed before establishing his own Rumtek Monastery. The objective of the monastery complex is to spread the teachings of Buddha for the liberation of all sentient beings from the suffering of Samsara. The four storey monastery, displaying the ancient techniques of Tibetan architecture, is surrounded by monks' quarters and a spacious courtyard where the famous sacred ritual lama dance takes place. Robust red pillars support the spacious interior of the main shrine hall. There is a main statue of Sakyamuni Buddha, flanked by Shari Putra and Mangal Putra on both sides. After an hour at Rumtek, we drove on to Martam, 5 kms ahead. On reaching Martam Village Resort, one of the `five heritage houses of the Himalayas', the charming simplicity and beauty of the place struck me. From far, you will not be able to make out that there is a resort there as the 11 cottages in the resort, from a distance, mingle with the huts in the village, amidst the green. I was given a very nice cottage to stay in. In fact I was the only person staying there and had the resort all to myself. The tourist `season' was at an end, the manager explained. The weather was very pleasant. The altitude is the same as Rumtek and a little lower than Gangtok. I did not have to use any warm clothes during my stay. However, a couple of days before, even Gangtok was quite pleasant and no warm clothes were required there either. The rooms are big and airy but very simple and the overall stress is on creating a village ambience. The floor is of red mosaic. Thankfully, no marble is used anywhere. There is electricity and running hot and cold water. I had a quick bath (as I was dirty from the rafting) and went for a walk in the village. The weather was good inspite of it being the month of June. The sun was going down. The valley was soaking in the last rays of the sun. I walked to a small monastery called Mani Lhakhang, a 10min hike up the hill just above the resort. The view from here is beautiful and you can see the Tinjure Hills looming right behind you and in front is sprawled the charming paddy fields that make up Martam. There was no one around the place except for the lone monk who took care of the Monastery. I spoke to him as he cooked in his quarters and later he opened the door of the tiny monastery and showed me the place. 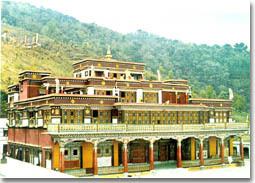 It belongs to the Karma Kagyupa sect, the same as Rumtek Monastery. On the way up one has to pass by a small monument constructed for the remembrance of the defeat of the Bhutan Army. The mantra "Om Mane Padme Hum" is inscribed by the wall. This means `Hail Jewel in the Lotus.' The place was so quiet and serene that I sat there and admired the dusk for quite sometime and for the first time during my entire trip I felt totally peaceful. The place was so quiet and serene that I sat there and admired the dusk for quite sometime and for the first time during my entire trip I felt totally peaceful. There are Lepcha manuscripts along with palm-leaf ones from Bengal and Orissa, coins and stamps, relics of Ashokan monks and a treasure trove of Tibetan books. The curator puts aside one of the 19 volumes of Prajnaparamita, or transcendental wisdom in 8000 verses that he is reading, to have an involved discussion with us. Tibetans in exile share a quiet dignified determination to reclaim their land. Later, I walked down to the village. There are paddy fields all over in terraced gardens. And small houses in between them. There is a narrow road meandering through the village in a gentle slope. Since I didn't have time, I decided to go for a morning walk the next day when the light would be better for photography. Returning to the resort, I went to the resort's decently stocked library, with some books on Sikkim as well. In the evening, the atmosphere at the resort was very quiet and peaceful (more than during the day), with lots of birds chirping in the garden. As dusk settled, I sat in the garden outside the dining room and could clearly see Rumtek Monastery across the paddy fields on the other side of the small valley. The next day, I woke up early and went for a walk through the village. There's a small cluster of cottages near the resort. I went there and chatted with the villagers and learnt more about their lifestyle. An old lady had just cooked `momos' for the family for breakfast and I tasted a few. They were just great. I walked to the St.Joseph's Convent. This school is quite a decent one and a lot of families have turned their homes into small hostels where the students stay. It's a major source of income for the families in Martam. A walk to the school takes around 15 min and is recommended as a good morning walk. After breakfast, I bid adieu to the resort staff for their wonderful hospitality and hired a taxi to take me back to Gangtok. The day was clear with the clouds beginning to form in the horizon. I guessed it would take them a couple of hours to cover the mountains. By then I would reach Gangtok. I decided to lean back on the seat and gaze at the landscape and the farmers sowing their paddy..it would be a while before I would get to see such natural splendour again.